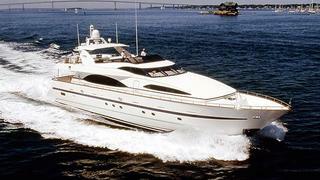 Welcome news from the Fort Lauderdale, Florida, office of Yachtzoo that Azimut’s 30.5m motor yacht Melimar is now sold. Built in 1999 as one of the yard’s Jumbo series, Melimar has been regularly upgraded and her hand-rubbed cherrywood interior features a five-stateroom layout for 10 guests in a master suite, two VIP staterooms and two twin cabins. Twin 1,850hp MTU engines power her to a cruising speed of 18 knots and a maximum speed of 22 knots.